"I’m sure I will test their faith"
Local Hispanic writer Mack, of Coyote Chronicles, has written twice recently about the intersection of religion and churchgoing. One of the columns uses basketball to offer a peek into Mack's past while at the same time explaining why/how he recently visited a church, and the other column discusses the social side effects of not attending church in the South. One day, when I was 7 or 8, a neighbor kid invited me to the Boys Christian League. I spent the remainder of my youth boarding a bus every Monday, Wednesday and Saturday to attend Bible study, practice of some sport, then a game to cap off the week. I went to their Summer camps. Equal emphasis was placed on Worship and sport fundamentals. The worship part didn’t stick. But I can still field a hot grounder, shoot a freethrow, and God have mercy on the receiver coming across the middle once I have the angle. But I actually enjoyed the Bible study. The Counselors told stories, and they were entertaining, sort of an early version of Veggie Tales, which, btw, I really love. Once puberty hit, spending three days a week in all male pursuits didn’t have the same draw, for some reason. So, eventually, I stopped going. I still played ball, and still do. But there is something to be said for fellowship. 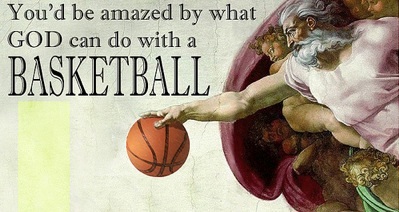 Before moving to Nashville, I used to play basketball with a group of guys that all attended the same Catholic church. The games were fast and physical, these guys had some game, and I really miss the adrenaline rush I felt when the guys and I were in synch, five guys all on the same wave-length. It really is special to not have to look to throw a pass…you just know your guy is there. After working up a good sweat, we would stand around and talk about life, soup to nuts, as The Primary Wife would say. We don’t attend church, which has actually caused my children some grief from their peers at school. One boy’s parents will not allow him to come over, though Nog is welcome at their home. The reason they gave is that we are not Christians. I wondered how they know that? Supermousey recently had a blow-up with one of her girlfriends, who later admitted that she never had a friend that challenged her beliefs before. I found that refreshingly honest at least. It's a bit of a trick to live and work here and to raise a family outside of any church-based social structure. It may be years before we know if we pulled it off…. Read the original columns in their entirety here and here. Photo by Robert Terrell. Licensed under Creative Commons. Seems The basketball diaries has already been written. Ha. Appreciate you sharing my post.